SD-WAN 1.2 Group Test Errata — NSS Labs, Inc. Since the publication of the results of our Software-Defined Wide Area Network (SD-WAN) Group Test, we have had a great deal of market excitement and client engagement. This new technology promises to lower costs without sacrificing performance and fulfills many enterprise technology demands by providing a simpler operational model. Enterprises choosing to evaluate or deploy SD-WAN products generally are large organizations with many locations (anywhere from 100 to 1,000+). Our original group test modeled total cost of ownership (TCO) based on three sites: a headquarters and two branch offices. In order to help larger organizations estimate TCO costs, we have modeled TCO for tested vendors based on 100 sites, and we are including the same link topology for each vendor (1 x 100 Mbps MPLS and 1 x 1 Gbps public IP service link of choice). In this 100-site model we have also factored in management/orchestration costs to deploy and operate a 100-site SD-WAN topology. While simplified, this TCO model allows us to extract the products’ rough costs for a 100-site deployment and provide guidance on a larger scale than in our SD-WAN Group Test. The following table represents the tested products that support 100 or more sites. It includes the costs for three years of ownership including acquisition and deployment plus initial setup time. Some vendors from our 2018 SD-WAN Group Test could not support a larger site requirement at the time of this publication and are not represented in this table. Additionally, we normalized data for all tested SD-WAN products with regard to remote configuration of the central management system (CMS) (i.e., individual appliance configuration vs. the “zero-touch” remote configuration that is characteristic of SD-WAN products). 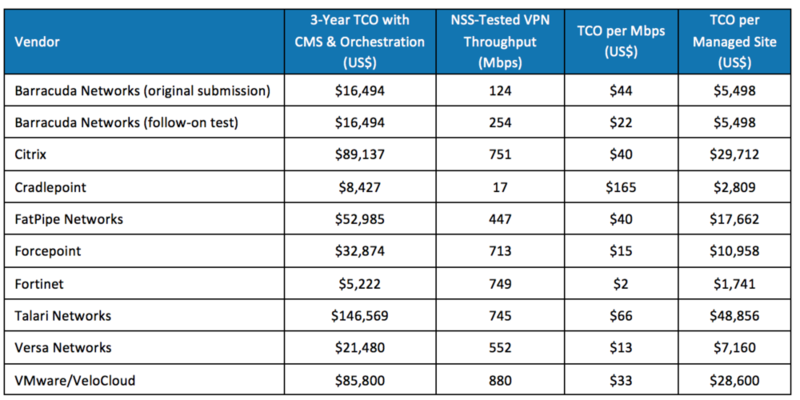 The following table shows how vendors stack up in this simplified model regarding 3-year TCO with CMS and orchestration. At NSS Labs, we strive to be as transparent as possible in all that we do, and we strive to ensure that enterprises have the most accurate information on which to base their decisions. Hopefully the additional detail provided in this blog assists you in your own SD-WAN assessment. The market is evolving at a rapid pace and there are many factors to consider; therefore, we encourage every organization to complete its own assessment based on its specific needs. If you have questions about this topic, please contact info@nsslabs.com. Older PostWhat's Driving the Adoption of CASBs?